Mog Blog: TEPS?? WHAT IS TEPS? So what is different between a TEPS boat and a standard or even hybrid trawler? Trade offs. They are important here, in order to understand why the TEPS boat idea works. 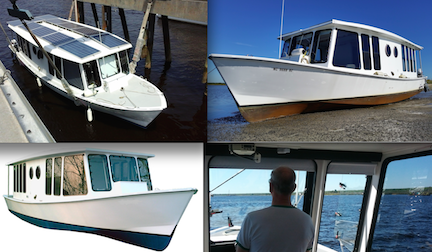 A boating pair bought a 40 foot name brand, new trawler and applied their many years of small boat experience. The first lesson was using the oven and stove (electric generator) to cook their first on board dinner. An electric two burner stove with oven required the generator for over four hours. Besides the smell of the roast beef, there was the diesel generator exhaust and the soft murmur of the droning gen engine. Lastly, the fuel used was of small effect on the whole fuel system but certainly would have effect over a month's daily use. The idea here is the 'trade off'. One is not on land and should be aware to minimize the use of a limited fossil fuel supply. Those trade offs, when applied to any boat increase extension of the boat's range while helping to reduce use, cost, maintenance and/or waste. The following are practices, applied to the TEPS boat, that incur trade offs when compared to more accepted standard boats. If any practice is unacceptable to the crew, then the amount of fossil fuel used will most probably increase. 1. Shape and the general look. Long, lean, shallow, extended sedan with decks. A long slender boat will be more efficient being pushed through the water. To further such efficiency a more shallow draft and lower cabin height will decrease water and wind resistance. These are generalities that hold quite well in most cases. A TEPS boat has a major functional envelope of near coastal waters, inner coastal sounds, rivers and lakes. The TEPS boat and nearly all comparable size trawler types are not a European CE type A ocean rated boat and should be used with the care of weather considerations first and foremost. 2. Design criteria for the live aboard life style. 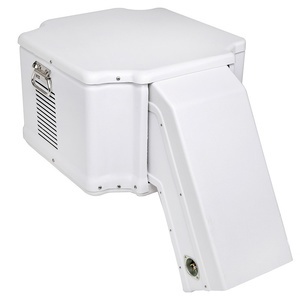 Goes anywhere within near coastal waters. On the hook or the hookup, is not mutually exclusive. However, a TEPS boat sure makes dreams of being at one with nature physically closer, a huge amount closer. Artful use of modern side scan fish finders and sharp eyes can identify shallow potential hull threats, allowing the captain and crew to go where only kayaks go. 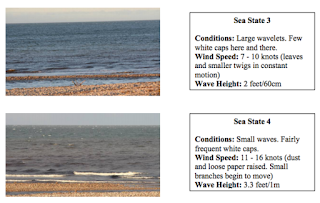 Getting close to shore is truly no comparison to being on the shore, a shallow 18 inch draft with twin skegs permits entry into shore areas with confidence. When on the hook, a TEPS boat is always hooked up to the sun for electricity, no dockside pedestal needed. 3. Expanded mindset of the boat user. Cool, heat, water, head & A/C units are solar. Creature comforts are similar on both types of boats. Locality then becomes the difference. Air conditioning a whole boat interior just for 8 hours sleep is convenient but that convenience comes with noise & exhaust, not to mention a huge investment in machinery and the space allocated, plus its total concealment. In most marinas it is illegal to run the generator overnight with carbon monoxide poisoning neighbors, not to mention the noise. With the advent of small, light, efficient portable A/C units, simply place the A/C where it is needed, such as in the sleeping area at night. The morning sun will replenish the amount of electricity used overnight. The brighter the sun shines, the more power is collected for the A/C to work. Definitely a COOL idea. With the use of paraffin, salt water, or other mediums to store heat from the solar modules atop the boat, the stored heat can later heat the cabin or hot water. Heat can be collected during the day and used at night to control the interior temperature. Such systems return their initial cost within a few seasons of use and are nonflammable, no electric shock hazard, very quiet with less critical mechanicals to maintain than engine or propane units. To augment the use of pure drinking water a TEPS boat utilizes the large solar electric collection array area atop the boat to gather rain water. There are 7.5 gallons per cubic foot. That means a rain storm of one inch on 12 square feet of solar roof would yield 1 gallon of water. A TEPS roof would be a minimum of 240 sq. ft., yielding 20 gallons in a rainfall of 1 inch. If the water is correctly filtered it can be used for laundry, bathing and if further purified, used as a potable water source. Composting commodes do not smell bad and take much less attention than a marine wet toilet. Furthermore, they do not use potable water to flush and process effluent. A person's solid & liquid waste along with a peat moss like material is all that is required. Vegetable only food stuff can be used also but no meats, fish or oils. A nice fact is that toilet tissue is good to use (within reason). Lastly, the composting commode requires no messy pump out. The reduced material is light, dry, odorless and clean enough to use in a garden or on a lawn. For example, a Sun-Mar mobile/marine unit would be a USCG Type III MSD. 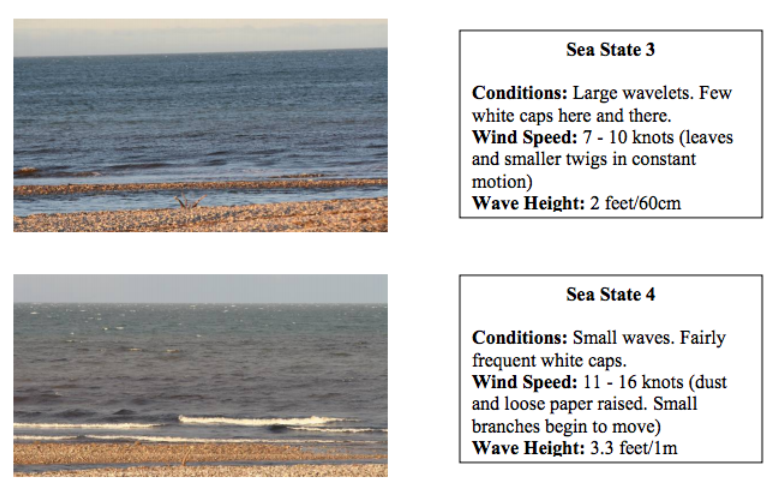 A Type I, the most sophisticated Marine Sanitation Device (MSD) is still not permitted to dump its well processed effluent in No Discharge Zones (NDZ) which comprise 30 to 50% of the U.S. east coast. Definitely make sure your are in the correct area before discharge. There are no such problems with a composting commode. The Sun-Mar dry composting head. 4. Maintenance comparison. All parts are modular, replace use FedEx. The mother of all extravagance is huge engines constantly run below their most economical power range. There are many reasonable fossil fuel, higher horsepower, auxiliary drive units that would complement a solar electric powered drive system without being the main drive power. If desired, auxiliary power is more than welcome with room to spare. A TEPS boat has a major functional envelope of near coastal waters, inner coastal sounds, rivers and near shore lakes. The TEPS boat and nearly all comparable size trawler types are not a European CE type A ocean rated boat. Because our electric motor of 15 horsepower of 20 pounds is much lighter than a 15 horsepower diesel of 200 pounds, it can be shipped FedEx, UPS or even mailed to the user. A diesel engine and transmission set would be trucked and probably too expensive for overnight delivery. Also the electric motors are now simple plug and play, try that with a diesel. Not to mention a TEPS boat requires no fossil fuel, oil, filters, changes, fuel pumps, fuel hoses, exhaust pipes, water cooled exhaust and electric starter, just to mention a few parts. Batteries are still needed and wires and checkups but that is far less work for the owner than one or two engines. All the electronics are self diagnostic. A fault will indicate the culprit, pull it out and exchange for a new part. Not the same as reading engine codes and trying to discern the location, then finding the offending part on an internal combustion engine. 5. Environmental envelope. From knee deep to near ocean waters. Deep and also very shallow water. To run a large boat ashore with no harm in less than two feet of water then allow the tide to let it rest level is a huge capability. Only very small boats or kayaks perform this task well. To do so in a 40 foot cabin cruiser is exceptional. One can pilot the TEPS craft up a stream or river to near the source and in some cases that source is a water fall. Few folks will ever have the capability to be in such a place to enjoy actually living at the falls for an overnight. 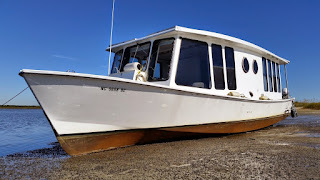 The boat is also adept at getting to and staying at the back side of a beach or sand spit to spend evenings with sunset dinners and sunrise breakfasts. Wilderness has never been this accessible. 6. Cost versus fuel/oil. Comparatively speaking, near zero. Zero is a great cost for fuel. Buy a boat and continue to buy fuel. Buy a TEPS boat and the fuel is paid. 7. Sea state to be encountered & self righting. Beaufort 3 with very low center of gravity. 8. Handling in open and close quarters. Instant reverse & forward and all day runs. As with most large dual engine boats, close quarters steering is very effective using the reverse and forward of the engines. A rudder can also be used. The TEPS boat not only allows both situations but amplifies the use of each. Motor steering is actually quite efficient for novice as well as the long time operator. Therefore selection of steering type use is by preference not mechanical dictate. No transmissions are utilized. The result of an electric motor is nearly instantaneous change of actual motor direction. Virtually no delay from direction to direction of the propeller with nearly the full torque of the motor at just a few revolutions per minute. 9. Noise and vibration characteristics. So quiet and no vibration. Engines need mufflers, motors just whir. Fossil fuel engines stop and start 8 pistons over 25 times per second. That pulsation produces loads of vibration and mechanical noise added to the already noisy exhaust explosions. The damping and quieting of an engine costs money, weight, thermal loss and unending maintenance. Yet the fossil fuel engine is chosen as main propulsion because it is a standard. TEPS boats are not fast with their electric motor and battery storage but an engine can be added for increased top speed. The difference is decided by the owner of the boat, to go without noise or add some noise to get somewhere faster. Bottom line for a TEPS boat is sailboat speed with no noise or fossil fuel while having an unlimited range (no fossil fuels). 10. Interior arrangements. Over 200 sq ft yielding cabins or open layout. Minor difference of standard and TEPS boats. Other than rooftop solar electric modules, the two types of boats have near equal amenities. At the current pace of technology the TEPS boat has parity with their trawler counterparts. In the near future they may actually surpass the standard trawler at a better price point and no fossil fuel use. There is no limit to the materials for either type of boat. The electric motor boat does not need to be built lighter or only of wood or exotic material. The materials chosen should match the market for the intended use of the TEPS boat. An ecological boat might be made of renewable wood or recyclable titanium. It all depends on price point, service type and expected service life. As a clinic in a far off area or a luxury boat in the midst of a Key West bay, the TEPS boat has power advantages and loiter times of a nuclear ship, limited only by fresh fruit and vegetables. The draft would be quite less, as well as cost. The main item here is that the TEPS boat is powered by nuclear fusion and that is just 93 million miles away.... a very safe distance. 12. Future of pure solar electric powered boats. MOG is the true beginning as of 1990.